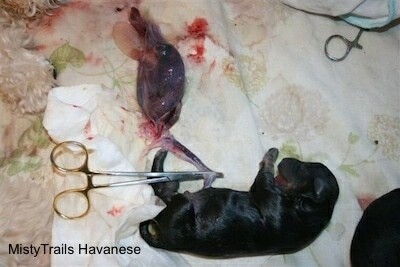 Presentation of puppy and delivery of placenta. Puppy may or may not be still in his sac. The sac needs to be removed immediately; just rip it with your fingers, clamp off the cord (cut and tie), and start rubbing the puppy till you hear him gasp. 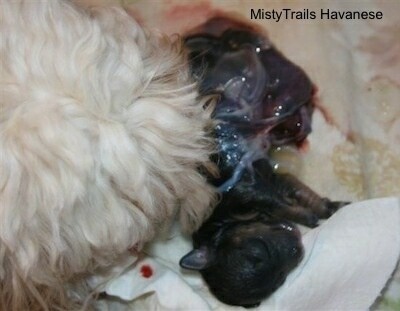 Then let him nurse till the next puppy comes (which could be minutes or a couple hours). 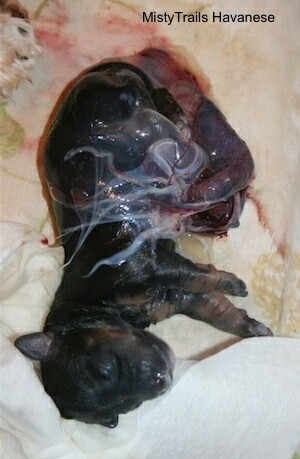 Make sure you count one placenta for each puppy. Some breeders let the dam eat half the placentas. I put the pups in a warm box (with a hot water bottle) while the dam is working on the next delivery, but keep the warm box where she can see her puppy as she will get concerned. 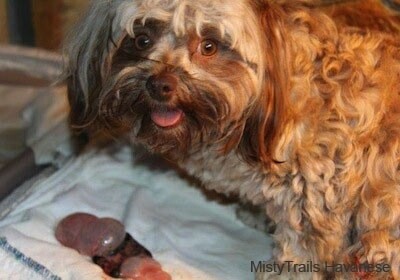 (I also give her back all the puppies between deliveries.) 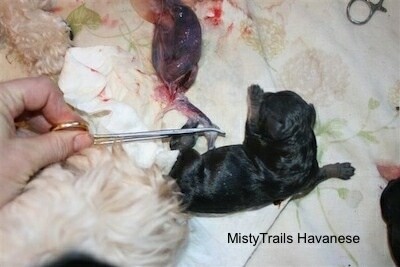 You do not want her to tramp on a puppy while trying to deliver another. 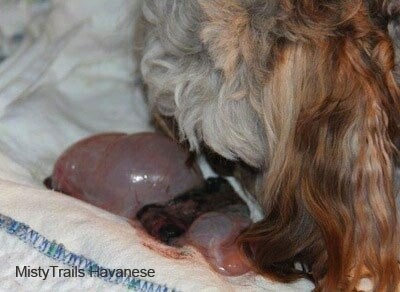 This is Kate after giving birth to her litter of puppies. I let her eat only one placenta. The placenta provides the dam with a good boost of nutrition, but eating too many can cause her to get sick making it hard for her to care for her newborn pups.